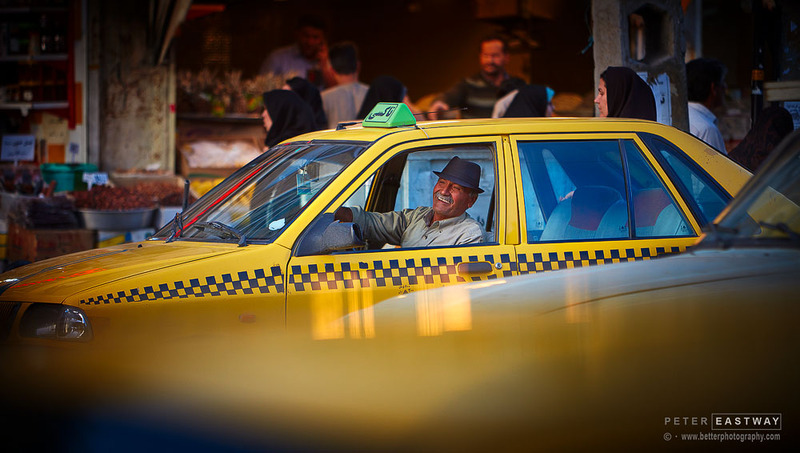 New York is known for its yellow taxi cabs and no doubt they are prevalent in many other cities around the world, but I'd suggest few cities have as many yellow taxis as Hamadan in Iran. On our photo tour, Nuran Zorlu and I spent a few hours loitering in the Hamadan's busy centre with our band of adventurous photographers. The Imam Khomeini square boasts a rich but decaying circumference of elegant building facades, with a hurried, bustling congestion below. Crossing the road to the park in the centre of the square was not without its challenges! Nuran had suggested that Imam Khomeini square was a great place to sit down and observe life, but we weren't sitting very long before we found ourselves the centre of attention, with plenty of opportunities to photograph the people. What struck me was the number of taxis, either in transit as a laneless melee around the park, or waiting in long lines for fares. The challenge was to capture them as a part of daily life. For the street scenes, I found a wide-angle lens allowed me to get close to the taxis as they whizzed past, placing them in the foreground and retaining the building facades behind. As I stood on the roadside, I noticed how every taxi had its own sub-plot inside, the life of the driver and maybe his passengers, so I switched to a 70-200mm zoom and lowered my camera height. This let me look across the road into the taxis and at the driver. On occasion I was discovered by the drivers, but never castigated. Perhaps it was because I was obviously a foreigner and somewhat of a novelty in a country that has recently re-opened its borders for general tourism. There's no doubt this taxi driver knew I was there! Note: Peter Eastway and Nuran Zorlu have another trip to Iran booked for April this year. After a couple of cancellations there are now some spots left....!